The “grand bargain” doodle will be on display on the DIA. The feds report on poor management of grants in Detroit. Jones Day opens a permanent office in Detroit. Here’s catching up on some Detroit bankruptcy tidbits. Gerald Rosen, considered the architect of the “grand bargain” can add “artwork on display at the Detroit Institute of Arts” to his resume. The museum will enshrine the famous doodle Rosen drew up on the back of a legal pad which laid the groundwork for the grand bargain. 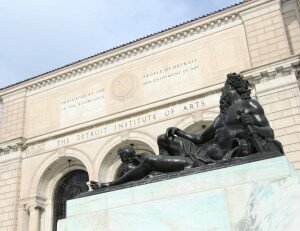 As part of the overall bankruptcy settlement, the grand bargain secured funding for the DIA from foundations, corporations, individual donors, the state of Michigan and DIA fundraisers to prevent the sale of the museum’s city-owned collection and protect it from sale to pay off creditors. Rosen is set to be the guest of honor at a private event on April 10, honoring his efforts in preserving the museum. Museum board director Gene Gargario has said that the doodle will hang “somewhere in its offices,” according to an interview with the Detroit Free Press. A recent study released by the U.S. Government Accountability Office shows that inefficiencies in Detroit’s bureaucracy led to a mismanagement of hundreds of millions of dollars in federal grants. Through a combination of inconsistent internal policies, outdated technology and bookkeeping systems, and layoffs during the fiscal crisis, deficiencies in handling government aid through eight federal grant programs put significant strain on the city’s finances even before the bankruptcy hit. The report, instituted by U.S. Rep. John Conyers (D-Detroit) and Senator Gary Peters (D), was launched to assess how federal aid is handled during fiscal crises. The report not only looked at Detroit but also at Flint, Michigan; Stockton, California; and Camden, New Jersey and found that the limited capacity of the cities in question severely restricted their ability to manage federal funds properly. Jones Day, the law firm that represented Detroit during its bankruptcy case, is set to open a permanent office in the city some time in July. The Detroit office will be the firm’s 17th office in the U.S. And 42nd in the world. Timothy Melton, a 1987 graduate of Wayne State University Law School, will be partner-in-charge of the office and is set to employ half a dozen lawyers plus support staff. According to Jones Day, the Detroit office will be connected to the firm’s network of 2,400 lawyers across 19 countries to act as a single worldwide firm, the firm said. Michigan Citizen and Kevyn Orr: Which history will be ultimately be written?